We’d love your help. Let us know what’s wrong with this preview of Holding the Fort by Regina Jennings. When dance hall singer Louisa Bell visits Fort Reno to see her brother, she is mistaken for the governess that the harried Major Daniel Adams is waiting for. Between his rowdy troops and his two daughters, he has more responsibility than he can handle alone. Eager for the opportunity, Louisa sets out to show the widower that she is a perfect fit. To ask other readers questions about Holding the Fort, please sign up. I can't read the book online. Is the only way to read the book is to buy it? Jessica Or check it out from a library. Aw, this was such a fun read! The story is lighthearted and very well researched. It was easy to like Louisa and to root for her and Major Adams to fall for each other. The two girls, Caroline and Daisy, are enjoyable youngsters as well. I have to say, that introduction between Louisa and Major Adams (him trying a stunt and landing at her feet!) was hilarious and one of the best/most memorable meetings I’ve read. I can always count on Jennings to write in some good humorous scenes, and this one w Aw, this was such a fun read! The story is lighthearted and very well researched. It was easy to like Louisa and to root for her and Major Adams to fall for each other. The two girls, Caroline and Daisy, are enjoyable youngsters as well. I have to say, that introduction between Louisa and Major Adams (him trying a stunt and landing at her feet!) was hilarious and one of the best/most memorable meetings I’ve read. I can always count on Jennings to write in some good humorous scenes, and this one was too much fun. Also, the General Sheridan vs. Edna scenes were most hilarious! It was dear and lovely to learn about Louisa starting to open her heart to God and realize her need for salvation. I love books that include a specifically Christian message, and this one is very well done. If you’re looking for a thoughtful book that’s light and enjoyable at the same time, pick this one up. This book is so good!!! I read it almost in a whole day, I couldn’t put it down. The wit and the humor was so enjoyable to read. The plot in general was so good. It seemed original too, which was refreshing. I cannot wait to start book 2!!! This was book one in the Fort Reno series by Regina Jennings and you can find book 1.5, Tried and True, and book 2, The Lieutenants Bargain, both of which I am very excited to read!! There was nothing I found to be “bad” in this book. It was super clean! Note: One scene is the Ifficer measuring Louisa’s back and shoulders for a dress but nothing happens. A mentions of how white Louisa’s skin is, and a few kisses that aren’t detailed. Holding the Fort by Regina Jennings was such a fun book to read. I can't even say how much I enjoyed it. When you think about a dance hall singer posing as a Mennonite Governess, it would have to be hilarious. Louisa gets herself in more situations than you'd think possible with Major Daniel Adams, the head of Fort Reno, when she's posing as his daughter's governess. This book was such a joy to read. I highly recommend it! I discovered Regina Jennings this year in reading Caught In The Middle. That book really impressed me. The next book I read by her, her very first book, wasn’t my favorite. Sixty Acers and a Bride had some wonderful elements but some content that I didn’t enjoy. Holding the Fort was fun and ranks between the other two books mentioned. Right off, I was a little worried about where this might be heading. After all, I started to see that deception might start playing a much larger role in the book then I thought. My worries were eased when I realized that it was more of a misunderstanding and then outright deception. Louisa also did not claim to be a Christian, which also eased some of my concerns. I don’t expect non-Christians to conduct themselves to a high standard of morality. This book was very clean. Despite all the opportunities for embarrassing moments, or overly romantic, the author kept the book very clean. I was impressed at how little kissing there was, and that was at the very, very end of the book. The two children in the story start out rather wild girls that need to be tamed. I was pleased that they weren’t truly bad girls, they were just in need of guidance. I get tired of children being nasty to everyone for no apparent reason. Sure the two girls had their moments, but I liked them. My biggest complaint about this book was that the faith element was weak. I felt as if had either been tacked on or that I was missing a chapter or two. Lousia was so hurt by her past experience with the church, and I didn’t really understand her change of heart. Daniel was a great leading man. He could be both serious and playful. Louisa was both strong and vulnerable. She was a very lovable person as she wants to do right, but doesn’t know how. The other characters in the story were well developed and added to the story. I would recommend this book to those looking for solid writing, sweet romance, and lovable characters. I received this book from Bethany House for the purpose of writing a review. I was not required to write a positive review. All the thoughts expressed are my own. Holding the Fort was a thoroughly delightful book! The story contained a nice balance of humor, serious dialogue, and questions of faith. I enjoyed the characters in this story, both the primary and secondary ones. Louisa was a likable character, even as she tried to uphold the ruse of being a governess. I appreciated that she kind of fell into that position and did not initially set out to deceive anyone. Once she found herself in that situation, however, I enjoyed watching her develop a conscie Holding the Fort was a thoroughly delightful book! The story contained a nice balance of humor, serious dialogue, and questions of faith. I enjoyed the characters in this story, both the primary and secondary ones. Louisa was a likable character, even as she tried to uphold the ruse of being a governess. I appreciated that she kind of fell into that position and did not initially set out to deceive anyone. Once she found herself in that situation, however, I enjoyed watching her develop a conscience regarding truthfulness. Her faith journey felt a natural part of the storyline. Major Adams was a fun character. I really liked him. He was a man of good moral standing, tried to lead his troops well, but had his own failings that he needed to work on. His developing romance with Louisa was sweet and fun to watch play out. I look forward to reading more books in this series. The plot sounded interesting enough and I'd say those words describe my general feelings towards the entire book: interesting enough. Interesting enough to keep me reading, but not enough to keep me mentally engaged. Every time I felt inclined to give up, something would happen to keep me curious for just a little bit longer. Nothing exceptional. Nothing terrible. More than a little preachy. While Holding the Fort wasn't my favorite book by Regina Jennings, I must admit it was a pretty adorable story. The first book in a new series, THE FORT RENO SERIES, it was engaging, fun, and easy to read. I ended up liking all the prominent characters: Louisa Bell, the dance hall singer. Her trouble-making brother, Private Willis. The rather endearing Major Daniel Adams, a widower and father. And the major's two daughters, Caroline and Daisy. There was a sweet romance, unexpected happenings, danger, and drama. Secrets and unwanted surprises. And a bit of a faith theme, which was touching. It was interesting to be in Indian territory, amidst a fort of soldiers and very little women. Caroline and Daisy kept things lively ... and Louisa, of course! *laughs* She was fun and sweet and spirited, and it was nice to watch her understand that she didn't need to change who she was to be accepted. With some humor, and some hurt, Holding the Fort wove together a fun story. For some reason it didn't end up being a favorite for me, but it was entertaining and I'm sure others will enjoy it! Wow - what a gorgeous cover!! In between the gorgeous covers of this book lies an equally gorgeous story, one that will draw you in from the very first page. This book has some beautiful characters. Major Daniel Adams is one of the kindest, most gentlemanly heroes I've seen. Louisa Bell has such a sincere heart and desires the chance at a normal, respectable life. Private Bradley Willis and the Major's two daughters, Daisy and Caroline, round out the supporting cast and are so much fun to read a . This book has some beautiful characters. Major Daniel Adams is one of the kindest, most gentlemanly heroes I've seen. Louisa Bell has such a sincere heart and desires the chance at a normal, respectable life. Private Bradley Willis and the Major's two daughters, Daisy and Caroline, round out the supporting cast and are so much fun to read about! Louisa's growth over the course of the story is very well done. I found myself rooting for her the entire way. I was very pleased with how her journey concluded at the end of the book. Holding the Fort is a delightful tale of mistaken identity, comical misadventures and sweet romance. I absolutely recommend this title and look forward to more of the series! Ugh, I don’t have the words, this was AMAZING!!!! 4 stars for the book, but only 3 stars for the audio version because I didn't care much for the narrator. Louisa Bell, aka Lola Bell, sings in a bawdy house, even though she's never done anything but sing, but still she's treated like trash by everyone. She loses her job at the Cat-Eye Saloon to a younger, more desirable singer and realizes she has no place to go. However, her brother is stationed with the calvary in Indian territory not too far away. He has gotten into a lot of trouble with his commanding officer and she figures she can help him if she shows up. On the way, she assumes the role of a governess to the commanding officer's children, purely by mistake. How hard can it be to teach two little girls? Major Daniel Adams just needs someone to take his daughters in hand. Widowed for years now, they've been left to basically run wild and now they need to be taught how to behave like young ladies ought to behave. If the new governess doesn't help matters, he's going to be forced to accede to his mother in law's request to send the girls to her in the city. He does not want to do that. Miss Bell doesn't look like a governess at all. She doesn't behave like one, either. She's too pretty and she teaches in a strange manner. Can Louisa hold her act together without creating suspicion? Can she truly find a respectable future? We'll see. Regina Jennings writes so convincingly that I was invested in the story from the very first few pages. Her characters are very real to the reader and their emotions are just as honest as well. I felt sorry for Louisa as she desperately longed to have a place in the world, not just someone everyone looked down on. We are all precious to God and I was rooting for her to realize that! I also loved the characters of the major's daughters! Since this is the beginning of a series, I do hope at least one of them gets to play a leading role in a future book. Recommended. *I was given a complimentary copy of this book by the publisher. My opinion stated here is entirely my own. Holding the Fort was such a joy to read. I cannot think of another book that had me giggling out loud as much as this one did in quite some time. It takes a special story to really be able to infuse humor into a romance during a time in history that was very stressful and could be deadly. I like that this story had such a quirky heroine. Her growth as a character and the transformation that she made in a world that often judged her and the wonderful romance that develops between her and Major Da Holding the Fort was such a joy to read. I cannot think of another book that had me giggling out loud as much as this one did in quite some time. It takes a special story to really be able to infuse humor into a romance during a time in history that was very stressful and could be deadly. I like that this story had such a quirky heroine. Her growth as a character and the transformation that she made in a world that often judged her and the wonderful romance that develops between her and Major Daniel Adams was both sweet and swoony. This is the first in a new series by author Jennings and there are a few side characters that I hope get their own stories. Every book I read by her is my new favorite one and I enjoy her out of the box storytelling. I highly recommend this one of a kind story with a heroine who knows her mind and a hero who knows his heart. I received a copy of this novel for free. I was not required to post a positive review and all views and opinions are my own. As soon as I turned the cover of this book the author had me walking in Louisa Bell’s shoes, and loving this girl. A big heart filled with compassion, and when she becomes homeless decides to go to her brother who is in the brig in Fort Reno. Be ready for a few chuckles and wonder how she does what she does, but with such a loving way, that faux pas are soon forgotten, but we do see what a great mind she does possess with her chess playing. Can a bar room singer get away with posing as a governes As soon as I turned the cover of this book the author had me walking in Louisa Bell’s shoes, and loving this girl. A big heart filled with compassion, and when she becomes homeless decides to go to her brother who is in the brig in Fort Reno. Be ready for a few chuckles and wonder how she does what she does, but with such a loving way, that faux pas are soon forgotten, but we do see what a great mind she does possess with her chess playing. Can a bar room singer get away with posing as a governess, well your about to see it happen, well kind of, until the mother-in-law goes falling down. Come and see how our lovely Lola Bell perceivers and we get some historical information along the way, and meet Major Daniel, the father of the girls and head of the fort. When the book ended I was ready for more, I wanted to stay here with these delightful folks. I received this book through Bethany House Publishing Blogger Program, and was not required to give a positive review. What a hoot! This book is well written and a lot of fun to read. I loved watching Louisa grow and see the positive impact What a hoot! This book is well written and a lot of fun to read. This was a fun book. The plot was well thought out and while predictable in its romance, it was also full Louisa is a dance hall singer. When she receives a letter that her brother is in prison at the army fort, she worries about his reckless behavior. When she's fired from her job, she decides to head to the fort to save her brother from himself. Due to a huge miscommunication she's now working as a governess for two wild little girls. And their father, Daniel, is as full of secrets as she is. Holding The Fort by Regina Jennings is a really fun historical Christian romance. It is the first book in the Fort Reno romance series and what a wonderful series it promises to be. The characters were realistic and well drawn. The leading lady is a delightful mix of confident yet vulnerable with a kind heart and an amusing personality. We all play roles in life. The person we present to the world may be very different from the 'real' us. Holding The Fort explores the different roles people play - Holding The Fort by Regina Jennings is a really fun historical Christian romance. It is the first book in the Fort Reno romance series and what a wonderful series it promises to be. We all play roles in life. The person we present to the world may be very different from the 'real' us. 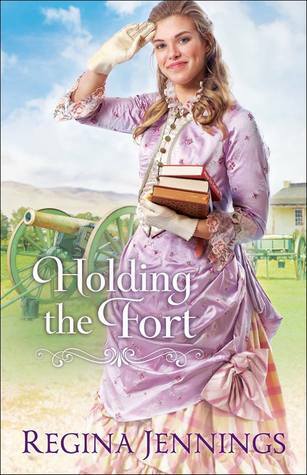 Holding The Fort explores the different roles people play - from upright soldier to the caring father; from saloon girl to tender hearted young woman; from young buffoon to brave rescuer. Each personality is multifaceted, adapting to the situation one finds oneself in. The novel is set in 1885. There is the question over the stability of the Indian territories. Figures from real life appear in the novel as fact bumps into fiction. Regina Jennings has some marvellous descriptive passages that enable the reader to 'march' through the action. There are the themes of secrets, truth and lies. No malicious deception, but truth is needed. Secrets do not make for a firm foundation upon which to build a life. The fragrance of God permeates the novel. Escape to Fort Reno today. Sink into the action, be amused and warmed by the characters. Enjoy Holding The Fort today. For me, the most powerful sentence in the whole book was: "I met someone who showed me unconditional love." Wow! That is God encapsulated in a sentence. There is nothing else to say. Wow! I have found a new favorite book! And can I be honest with you? I did not expect to like it—like at all. I went into reading the book with a “I’m not going to like this book” attitude, but, boy, I was wrong. I honestly don’t know why I didn’t expect to like it. I mean, I didn’t really like the cover; it just isn’t my type. Or maybe I read a certain synopsis that I didn’t like. I have no idea. The main characters—and side characters—were awesome. I really felt as though I “knew” them. Jack wa Wow! I have found a new favorite book! And can I be honest with you? I did not expect to like it—like at all. I went into reading the book with a “I’m not going to like this book” attitude, but, boy, I was wrong. I honestly don’t know why I didn’t expect to like it. I mean, I didn’t really like the cover; it just isn’t my type. Or maybe I read a certain synopsis that I didn’t like. I have no idea. The main characters—and side characters—were awesome. I really felt as though I “knew” them. Jack was my personal favorite. I really want to read a book about it. Bradley was also awesome. I hope there is a book about him too. Some of what Jack and Bradley said had me laughing—out loud! Usually, I don’t smile or laugh while reading. I just smile and laugh in my head. However, that was not the case for this book. I couldn’t stop laughing for some parts. I would have to say that Louisa wasn’t my favorite. However, I still liked her as the leading lady. I really liked Daniel. He was the perfect main character! The time setting, the plot, the everything was great! As I said, I didn’t like the cover. So, I have to give it 2 stars. However, I loved the book. Holding the Fort is a new favorite of mine. Regina Jennings definitely deserves 5 stars! I cannot wait until the next book in the Fort Reno series. I received this book from the Bethany House Publishing of the Baker Publishing Group for this review. This review is written in my own opinions and words. The first in a series about Fort Reno. Louisa is a dance hall singer who loses her job and has no place to go except the fort where her brother is stationed. He is in trouble as usual and she wants to help. She is mistaken as the governess that the commanding officer was waiting for. She tries to act like a governess and help her brother. Lovely Lola Bell was raised in a saloon, but her singing voice has meant she’s managed to keep from working upstairs. Except now she’s been fired, and no one in town is going to give a saloon girl a respectable job. Then she hears her brother—her only family—is in trouble. She has no choice but to become Miss Louisa Bell, find Bradley at Fort Reno, find a respectable job, and hope her past never catches up with her. Major Daniel Adams is a widower with two daughters. When Miss Louisa Bell arrives Lovely Lola Bell was raised in a saloon, but her singing voice has meant she’s managed to keep from working upstairs. Except now she’s been fired, and no one in town is going to give a saloon girl a respectable job. Then she hears her brother—her only family—is in trouble. She has no choice but to become Miss Louisa Bell, find Bradley at Fort Reno, find a respectable job, and hope her past never catches up with her. In some ways, Holding the Fort was a typical Western romance. Beautiful heroine meets handsome hero, fall in love, and so on. But that would be missing the best parts: the comedy, and the Christian element. Regina Jennings writes comedy. Well, this had a lot of comedy—awkwardly comedic situations, similar to Karen Witemeyer or Jen Turano. There can be a fine line between comedy and cringefest, but I definitely found Holding the Fort was comedy (especially a couple of the riding scenes). It was also Christian. Lola aka Louisa was not a Christian. She’d been raised in a saloon, hardly the kind of place you’d find a preacher. She does a so-so job of pretending, but when it comes out that she’s not a Christian, Daniel has a dilemma. He’s attracted to her, but … Anyway, that ended up being one of the strengths for me. Overall, I loved Holding the Fort. Recommended for fans of romantic comedy, especially historical Westerns. What I Loved: I always enjoy a military setting, so I was smitten with Hold the Fort from the moment I had first heard about it. Jennings incorporates military life at a western fort along with historical details about the conflict with the relocated tribes in the area. I learned some things along the way which is always a treat. With this as a backdrop, she adds in a beautiful romance, two charming girls, and one sweet talking hero. And then there’s the well thought out gospel presentation weav What I Loved: I always enjoy a military setting, so I was smitten with Hold the Fort from the moment I had first heard about it. Jennings incorporates military life at a western fort along with historical details about the conflict with the relocated tribes in the area. I learned some things along the way which is always a treat. With this as a backdrop, she adds in a beautiful romance, two charming girls, and one sweet talking hero. And then there’s the well thought out gospel presentation weaved into the storyline. Rating and Recommendation: I’m giving Hold the Fort 5 stars and recommending it to those who enjoy Christian Historical Fiction or a novel with a western military fort. Running a Kansas Fort on the frontier with Indian Territory, and with two daughters in desperate need of training and education, Major Adams agrees to hiring a governess. Anything to stop his mother in law from pulling his girls away, she thinks that Fort Reno is no place for growing girls. She's sung her last song as a singer & performer at the Cat Eye Saloon. Replaced by a younger, albeit less talented model, Louise 'Lola' Bell is suddenly unemployed and homeless. Taking a huge leap of fai Running a Kansas Fort on the frontier with Indian Territory, and with two daughters in desperate need of training and education, Major Adams agrees to hiring a governess. Anything to stop his mother in law from pulling his girls away, she thinks that Fort Reno is no place for growing girls. She's sung her last song as a singer & performer at the Cat Eye Saloon. Replaced by a younger, albeit less talented model, Louise 'Lola' Bell is suddenly unemployed and homeless. Taking a huge leap of faith that he brother stationed at Fort Reno will be able to help her find work, she sets out. On her journey she is presented with an opportunity, deliver a crate of books to the Major. Upon arrival one assumption leads to another & she is mistaken for the educated and proper governess the Major sent for. Hoping to play this role just long enough to find her brother and figure out her future, Louisa pulls off the biggest performance of her life. As the story develops and Louisa & Daniel interact it's clear to see that despite the deception, something good could come from this for both of them. Louisa is pushed further and further into guilt, with Daniel mistakingly assuming her brother is secretly pursuing her, there's plenty that keeps the pages turning. Throw in the difficulties arisen from issues between the Indians and those crossing their land and there's enough action to add depth to this story. I love the way Regina retells these true circumstances from history and weaves them into her novels. She transports me to a time and place I know nothing about and richly embellishes these stories with engaging characters, and faith filled messages of hope. It's inevitable that one day Louisa's ruse will come to a crashing end, but will she confess the truth or will her lie be found out some other way. Either way she is convinced she will loose the only people to ever feel like a true family, along with her brother - who appears to get in far too much trouble for his own good. Fantastic first book in Regina Jennings new series, I'm excited to see where we are taken next, and with whom! When you are in the mood for a trip to the old west, life in a fort, and a sweet story about faith, love and forgiveness then this should be one of the books you pick up to indulge that feeling. While this book is labeled as western Christian romance, it is not heavy on the religious aspect. There is the right balance of faith/religion, love, action and the wisdom of two young ladies. This story touched my heart in many ways. Louisa was way out of her element pretending to be a governess to the When you are in the mood for a trip to the old west, life in a fort, and a sweet story about faith, love and forgiveness then this should be one of the books you pick up to indulge that feeling. This story touched my heart in many ways. Louisa was way out of her element pretending to be a governess to the Major's two daughters. But she would stay up reading ahead so that she could instruct these young ladies in their studies. Don't get me wrong, she was not unintelligent, she had just not gone very far in school which is not surprising for the time. But when it came to instruction on areas such as singing - this is where she excelled. The way Louisa handled herself in various difficult situations was admirable...however, she probably should have come clean much sooner about who she was and why she was at the fort. Daniel (the Major) was a widower trying to do his best in raising two rambunctious girls, away from civilization...and with an overbearing mother-in-law that wanted the girls to live with her. He is strong in his faith which is what ultimately helps Louisa admit her past and accept her destiny. I cringed at the thought of how Daniel would react when the truth came out about Louisa. However, his reaction was that of a Godly man that believed in truth and forgiveness. I laughed along with Daisy and Caroline as they fought against instruction from Louisa, but came to love her in the end. Daisy's innocence is quite captivating as she has no filters on what comes out of her mouth. As they say, "out of the mouths of babes!" But I felt this just added to the complexity of the characters and the situations they faced. When I read the description of this book, I honestly expected to find the premise a little unbelievable. It seems like mistaking a dance hall singer for a governess is quite a It is amazing how much I still learn about the West while reading fiction after all these years. Regina Jennings packed so much history into Holding the Fort, written about the actual military fort, Fort Reno. It is clear she did a lot of research for this book, and yet not a minute of the book was dry or uninteresting. I loved how totally out of her element that Louisa was. She knew she was over her head, but tried so hard to act her way through. And quite admirably. I was also touched by the way she felt so little about herself after having been scorned by the "church ladies" back in Wichita. It was heart-breaking to see how she was judged without anyone trying to find out if the accusations against her were true. Sadly, even today we in the church are so quick to judge and so slow to show mercy and lead sinners into grace. I hope at least some of the people reading this book take that message to heart. The attraction between Louisa and Daniel was so sweet and tender. The way that Daniel was so determined to do everything properly was great. I especially loved the way he "took" Louisa on a date and in doing so also showed his daughters the way an honorable man treats a woman. With fun loving characters, laugh out loud moments, and a whole lot of heart, "Holding the Fort" is another winning novel from Regina Jennings. Louisa is a zany, likeable young lady who will surely win your heart within a few pages of becoming acquainted with her. Her desire to look out for her brother is a sweet one, and the misunderstanding that results in her becoming a governess makes for some highly interesting moments. Some of the scenes, of course, you may need to take with a grain of sal With fun loving characters, laugh out loud moments, and a whole lot of heart, "Holding the Fort" is another winning novel from Regina Jennings. Louisa is a zany, likeable young lady who will surely win your heart within a few pages of becoming acquainted with her. Her desire to look out for her brother is a sweet one, and the misunderstanding that results in her becoming a governess makes for some highly interesting moments. Some of the scenes, of course, you may need to take with a grain of salt in terms of their plausibility. But therein lies all the fun! Sometimes, you just aren't in the mood for a book that delves deep into the tragedies of the human existence. Sometimes, you just need a book that will elevate your mood and bring a smile to your face, and "Holding the Fort" will do all that and more! And, in the midst of the fun, you will walk alongside Louisa as she is brought to the feet of Jesus, and watching her faith blossom was one of my favourite parts of this story. Those readers hankering for a sweet romance will enjoy watching Major Daniel Adams become smitten with Louisa and her quirky ways. The puppy love that strikes Daniel definitely brought a smile to my face as I resonated with a few of his clumsy moments. The ending is made all the sweeter for Louisa's difficulty in believing that she's even lovable - and who of us hasn't struggled with those thoughts at one moment or another? Historical fiction fans will flock to this novel in droves. I award this novel a solid rating of 4 out of 5 stars, and am so glad to see that this is only book one in the "Fort Reno" series. I'm looking forward to what will come next for these characters! I really enjoyed the story (though I had some small initial hesitation, even having loved the author's previous works--nothing good ever comes from lying about who you are). But it's delightfully funny, it's sweetly romantic, and it's a marvelous example of grace--everything I've come to expect from the author, while at the same time tackling a difficult subject. Anytime the main character is masquerading as someone they're not, no matter how innocently begun, you know trouble is coming. The trut I really enjoyed the story (though I had some small initial hesitation, even having loved the author's previous works--nothing good ever comes from lying about who you are). But it's delightfully funny, it's sweetly romantic, and it's a marvelous example of grace--everything I've come to expect from the author, while at the same time tackling a difficult subject. Anytime the main character is masquerading as someone they're not, no matter how innocently begun, you know trouble is coming. The truth will out. Louisa certainly should have told Daniel the truth right away, but I like how the author treated it (it wasn't nearly as painful as I feared it would be). Daniel deserves some credit for that--he's a man of grace, who suspects she's not all that she seems. He knows she has secrets, but while he doesn't know what those secrets are, he has observed enough of her character and heart to love her regardless. Between his grace, his authority, and an unexpected reckless streak, he's a supremely attractive hero. It was fun to recognize a smidgen of the history included in the story; I didn't know a thing about Fort Reno, but I am familiar with General Sheridan and have read enough about the Indian Wars and frontier forts to recognize commonalities across the board (not always things to be proud of . . . but history cannot be changed at this point). I can't wait for more stories about the fort--I hope to hear more about Louisa's brother and the learned lieutenant. Sometimes it is good to just kick back, relax, and indulge in a fun, light, tickle-me-pink story that still holds a good, clear message of the goodness of God and His forgiveness. Holding the Fort is just such a book. Typically I don't care for wild west stories that involve dance hall girls but this one is different. The heroin of this story is a young woman who is the result of a single mother that lived a low life in the dance hall environs. But Louisa managed to be in the environment (or in t Sometimes it is good to just kick back, relax, and indulge in a fun, light, tickle-me-pink story that still holds a good, clear message of the goodness of God and His forgiveness. Holding the Fort is just such a book. Typically I don't care for wild west stories that involve dance hall girls but this one is different. The heroin of this story is a young woman who is the result of a single mother that lived a low life in the dance hall environs. But Louisa managed to be in the environment (or in that world) and yet not of it. She managed to keep herself pure and free of the encumbrances of what usually befell young women whose livelihoods involved work in a dance hall or saloon. She sang. She sang beautifully. She dressed in the elaborate, colorful, silky finery of the stage. And that is all. But it came to an end when another took her place on the stage that was more compliant with demands placed on her. So Louisa left and traveled to Fort Reno. And how she took on the role of governess and teacher when she had very little education herself is a funny and interesting story. The territory is unsettled with Indians and cowboys at odds with one another and the Mennonite missionaries and the US Army trying to keep things calm. The antics of Louisa's brother and the Major's youngest daughter coupled with the aide assigned to the Major will keep the reader totally having a blast of fun. I enjoyed this book and can easily recommend it. “But Why didn't she tell me? Why hide it?" ..."Would you brag about having a brother like me, sir?"